In the Camera view, enable Render View to see the effects of the pencil line thickness settings. 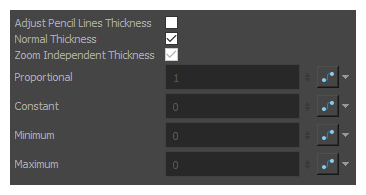 Select the Line Thickness tab. Ajust the following parameters to have the desired pencil line thickness in the current frame and camera position. To start animating the pencil line, create a function on one or more of the Proportional, Constant, Minimum and Maximum parameters by clicking on their corresponding Bezier button, depending on which setting(s) would better accommodate the desired effect. Click again on the parameter's Bezier button to open the Function Editor for that function. Use the Function Editor to animate the value of the parameter across the scene.